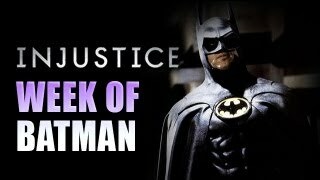 Batman and Maximilian are called upon once again to save the universe from "Injustice." Will the "Gods Among Us" prevail? Find out inside. Part two of the "WEEK OF!" Batman is here. Maximilian is in a fresh set of Injustice: Gods Among Us ranked matches using Bruce Wayne. You can revisit the first part here.